The history of the lathe machine for woodworking can be traced back several thousand years. 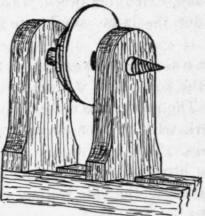 The earliest woodworking lathes date back to around 1300 BC when the ancient Egyptians first used a two person lathe. It was operated by one person turning the wood piece with a rope, while the second person used a sharp tool to carve into the woods surface. These simple machines are widely believed to be the first machine tools created. This simple design was later improved upon by the ancient Romans who replaced the rope with a bow to improve the turning process. Later, during the middle ages, a foot pedal was introduced and hand operation was replaced. This style of machine is known as a spring pole and was commonly used until the early 20th century. This was a major advantage to the wood craftsman because he could now use both hands to hold and guide tools. The first information on the form taken by the lathe comes from the 3rd century BC but it was in use long before that. A flat wooden dish which stood on wooden legs was found in a pit grave at Mycenae dated at 1100 to 1400 BC. This dish has low side walks with a bead running around the top, which is typical of turned work. There is also a hole in the centre, which has been plugged. This suggests that it could have been turned on a mandrel held between centres in a lathe. Against this view must be set the fact that there is no sign of turned grooves on the piece. ANSI standards are not law. They are standards. Each person must decide for themselves whether or not they choose to adhere to these new standards. We make it as easy as possible for you to comply by designing the retrofit door and interlock switch operation in such a way as to allow the convenience and efficiency of manual operation, while still providing for compliance with these new standards. Even after the upgrade, our products will retain the ease of use and flexibility you bought them for. Properly using them will keep you in compliance.